Eddie Salter of Evergreen, Alabama, is no stranger to the turkey hunting community. The 49 year veteran of the spring woods, and host of the new Turkey Man series on the Pursuit Channel, Salter has long been regarded as one of the most knowledgeable and accomplished turkey hunters in the industry. Salter, who works closely with Down-N-Dirty Outdoors on their call development and video production, was gracious enough to sit down with us for an interview on a topic that all turkey hunters face year in and out: early season turkeys. WTR: Eddie, where are you going to kick off your 2013 season? WTR: Let’s talk early season turkeys. Obviously, there’s certain advantages and disadvantages to hunting early season turkeys, with the advantages being unpressured birds and the disadvantages being the woods being bare and turkeys often being bunched up. What is your general approach to hunting early season birds? WTR: Say the only option you have is that big group of turkeys. Then what is your move? 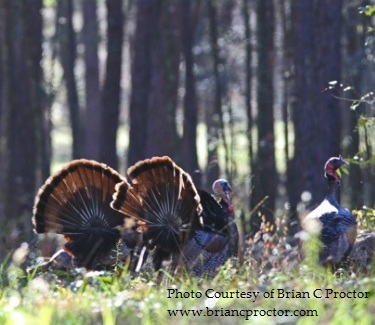 WTR: Attitude is a big part of any phase of the spring turkey season, especially early season. Do you think that having a positive attitude is important when hunting early season? WTR: Any off-beat tactics you try to use in the early season? WTR: In closing, do you think it is important for hunters to be able to run multiple calls in the early season? For more information on Salter’s Turkey Man series or products by Down-N-Dirty Outdoors, visit www.downndirtyoutdoors.com!